Timeline Challenge - Had a friend over who is a bit new to the modern board game world and was curious to try a couple. Possibly not the best board game to introduce someone to the hobby as it's basically a different type of trivia game, but it worked well and he won our 3 player session. While Timeline is just another answer questions party type game - I feel the educated (and random) guesses you can make never feels like your totally out of the game, and its got enough of a modern twist for it to be a bit unique. Not as much of a pick up and play game as the basic version of Timeline, but I do like the various challenges that I personally think add to the game. Welcome To The Dungeon - I was late to buying this game and even later to actually getting around to trying it. It was sort of appealing but at the same time I also couldn't really be bothered with it as I didn't really think it was going to be anything special. Well for a little box its filled with fun! There's luck involved - like all card games, but there's a whole lot of bluffing and strategy going on in simple 5 minute rounds to make this one of my new favourite really quick fillers! Technically a full game of four players can last a while, but I haven't minded just playing a few rounds until the first player is eliminated and crowning the winner the player who has the most successes or a final tie breaker round. Not the way it was designed, but in small portions I'm really enjoying The Dungeon! 5 Second Rule - It was my birthday on the weekend and some friends bought me this for my birthday. As with Timeline, this is another one of those party quick thinking kind of like a trivia type of games. Timeline is better. But 5 Second Rule does have its merits. The first round it seemed like 5 seconds to answer a question was impossible, and as players before you use all the easy answers that you can't repeat, it was making things tough. After a couple rounds however, everyone was mentally ready and 5 seconds seemed like just enough time to shout some random answers out. Truthfully, this isn't exactly my type of game. However it was very kind of the friends who bought it for me and it will have a place in the library for those very non board gamer friends who won't try anything that looks imaginative at all. Rhino Hero - Classic simple kids game that I always have fun with regardless of who's playing and how old they are. Not the greatest in longevity and definitely just a filler, but Rhino Hear nonetheless will have some moments of laughter and tension. No strategy, mostly dexterity in this Jenga/Uno hybrid of a game. Hey, That's My Fish! - Another one of those simple to play charming games that I have only recently decided to give a go. This one is a surprisingly tactical but with a quick playing time and accessible rules, it's fairly easy to pull out for a quick round or two with anyone. No Thanks! - Another simple game. If you haven't got the theme this week, well it was mostly basic games for my birthday spent with friends and family who mostly don't play a lot of games. That's where all these ones like No Thanks! and the aforementioned games come in handy as trying to convince people to sit down and be immersed in a three hour session of Dracula was never going to happen. Pull out No Thanks however and everyone is up for a game. Great game for anyone. Camel Up - About as deep as I tried to go on my birthday and while others seemed to enjoy the game, I'm not convinced I really did. Camel Up is okay, possibly playing with the full player count hurt this game as by the time it came to your turn again - most of the actions you would have done were taken. I managed to win this, but didn't feel very engaged the whole game which is pretty rare for me. Maybe all the easy games beforehand had been too much and I was craving something with substance and certainly didn't find it here. Ca$h 'n Guns - After Camel Up, I thought this might be the difference. I've had some really good games of Cash n Guns in the past, but this wasn't really one of them. Must have been the group I played with. We opted to not use the special powers as to not confuse the newer players, but still it was a struggle for some players to grasp. Don't ask why, but things like dropping out of the gun fight with no guns pointed at you and taking a $5000 bill when there was $20,000's in the loot still caused a bit of frustration for me. The first time this game has just been OK.
Dead Of Winter - Finally. Something to sink my teeth into! 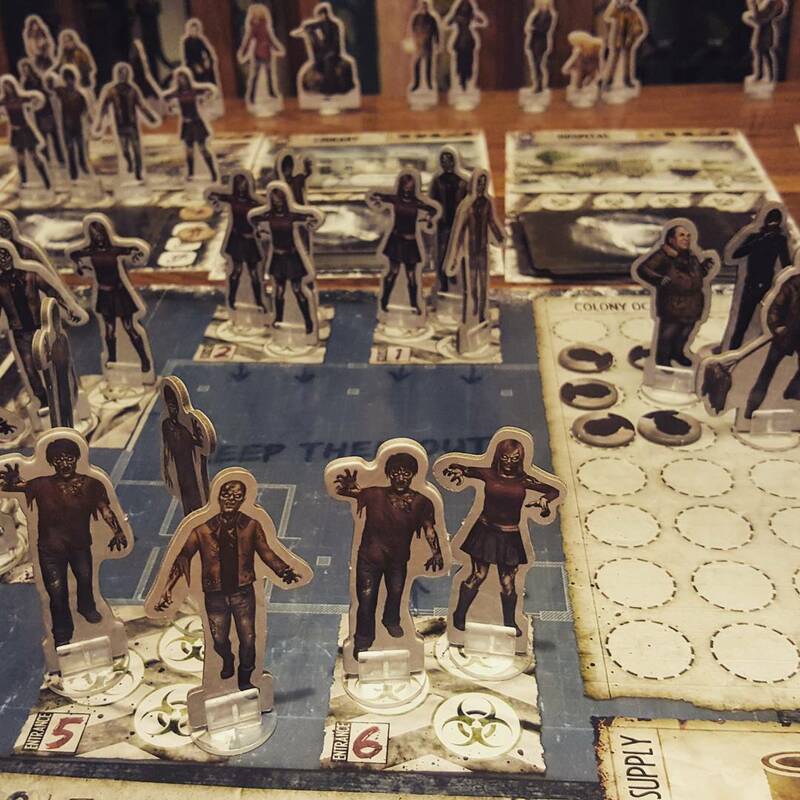 The next night I invited our normal board game crew over and we played a game that I've rarely been able to play. I think I've tried this a total of 4 times and its ALWAYS been with new players (including this session) and I've always resorted to using the suggested 'first play' scenario of getting zombie blood. Not this time! I was determined to try something else and after a vote between two that I had previously picked - we tried to survive 5 rounds. The game was going well, everyone seemed to pick things up fairly quickly (except we forgot to read crossroad cards far too often) and we were successfully completing all the crisis's every round. I was beginning to think even though I had made it a 20% chance for a betrayer that we weren't going to have one. That was until the 2nd last round when everything got sabotaged by a serial killer betrayer! Unfortunately he sabotaged us too well that round and ended the game before he had successfully killed enough characters. 2 hours later - no one won! But it was definitely the pick of the week and I'm glad to finally have tried a different scenario! See you in another year Dead of Winter..
Kingdomino - So I decided to see what all the fuss and hype was about on this inexpensive award winning board game. Never really played dominoes but am intrigued enough to hope for another simple accessible classic along the lines of Splendor, Karuba etc. Wouldn't surprise me if it gets played next week.